Spray oval 5-quart slow cooker with cooking spray. In large microwavable bowl, mix brown sugar, butter, pumpkin pie spice, salt and water. Microwave uncovered on High 1 1/2 minutes, stirring once. Stir in vanilla. Add sweet potatoes; stir to coat thoroughly. Pour mixture into slow cooker. Cover; cook on High heat setting 3 1/2 to 4 hours or until fork tender. Reduce to Warm heat setting until ready to serve. Stir mixture; top with marshmallows, and cover 1 to 2 minutes or until marshmallows melt slightly. During the holidays or when you’ve got company coming, using your slow cooker as an alternative oven works well. Actually cook, reheat, or just keep food warm. Potatoes in particular, that tend to cool down quickly, are a good choice to slowly heat up, then serve from a ceramic crock. Want a mashed sweet potato casserole instead? Before topping with marshmallows, mash, crush or smash potatoes using potato masher, or beat with electric mixer on low speed until well blended. Do not overmix. Continue with recipe as directed. Be sure to generously butter or oil the entire inside of the slow cooker crock—clean up time will be much easier. If you like the toasty marshmallow look of the traditional casserole, just pour the cooked mixture into greased or sprayed 13x9-inch ovenproof casserole, top with marshmallows and broil 6 inches from heat 30 seconds to 1 minute or until marshmallows just begin to brown. Whether you bake sweet potatoes in the oven or cook them in the slow cooker like in this recipe, you probably have come to associate sweet potato casserole with Thanksgiving. And what makes it really special? The marshmallow topping, of course! Though nowadays it doesn’t seem too out of the ordinary to top a savory dish with fluffy marshmallows, take a step back and you’ll find yourself wondering: who came up with such an unlikely, delicious pairing? You may be surprised to find out that though candied sweet potatoes were being made in America in the 1800s, it wasn’t until the turn of the 20th century that it was suggested to top candied sweet potatoes with marshmallows. 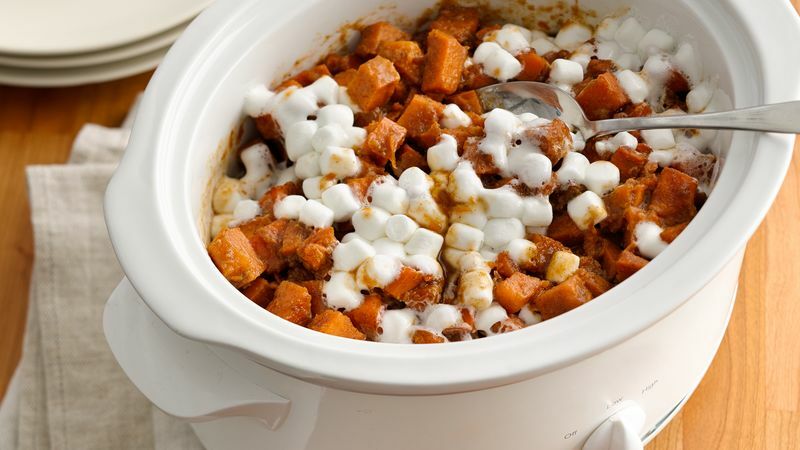 It’s been reported that the company Angelus Marshmallows promoted the first recipe to use marshmallows as a topping for sweet potato casserole as a way to sell their product, and it picked up steam from there. Now you’ll have a hard time finding a table in the United States that doesn’t serve this unique dish on Thanksgiving. First time making sweet potatoes? This slow-cooker version is foolproof, but if you have any questions or want to learn more before you get started, check out our easy-to-follow how-to guide.